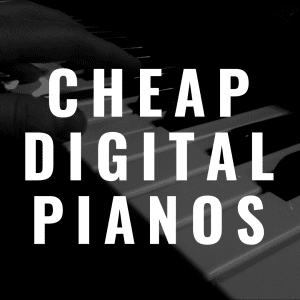 Digital pianos are expensive. To make matters worse, it sometimes seems impossible to choose the digital piano that’ll best suit your needs and fit within your budget. 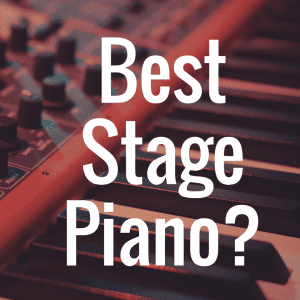 For this reason, we compiled a list of the 5 best digital stage pianos that you can get for under $500. All of the keyboards listed here are 88 keys. Having a full keyboard is important, especially as players advance and play songs that contain a wider range of notes. Buying a full-sized keyboard right away will save you money down the road. To better help you, please take a look at the table below, where you can directly compare many digital pianos that can be used on stage based on things like price and noteworthy features. What Should I Look For in a Digital Piano? 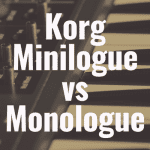 Now when we say “stage pianos,” a lot of people automatically think about the more robust and expensive pianos—like the Yamaha CP4, Korg Grandstage or the Roland RD2000. But there are less expensive pianos that, while they certainly won’t have as much features or the exact same build quality, can certainly do a good job for a very affordable (sub $500) price tag. Digital piano buyers should look for versatility. Pay attention to the number of built-in voices a digital piano contains, the effects it has, and whether or not it can be connected to recording software. All of these features give players room to grow as their piano-playing skill progresses. Polyphony is another important factor. Anything under 32-note polyphony is inadequate, and 64-note polyphony gives players the capability to create more complex sounds by layering voices and adding effects like reverb to their playing. For $500, 128-note polyphony is likely the highest amount of polyphony available. With this amount, players have plenty of room for experimentation. 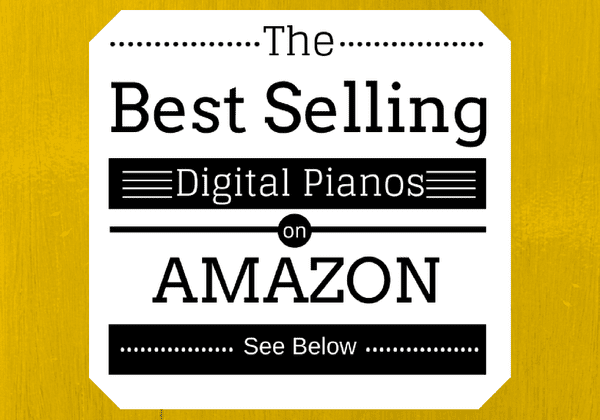 Below, please take a brief moment to view some of the best selling digital pianos available on Amazon. Beginners should pay attention to the learning tools each digital piano model offers, as well. 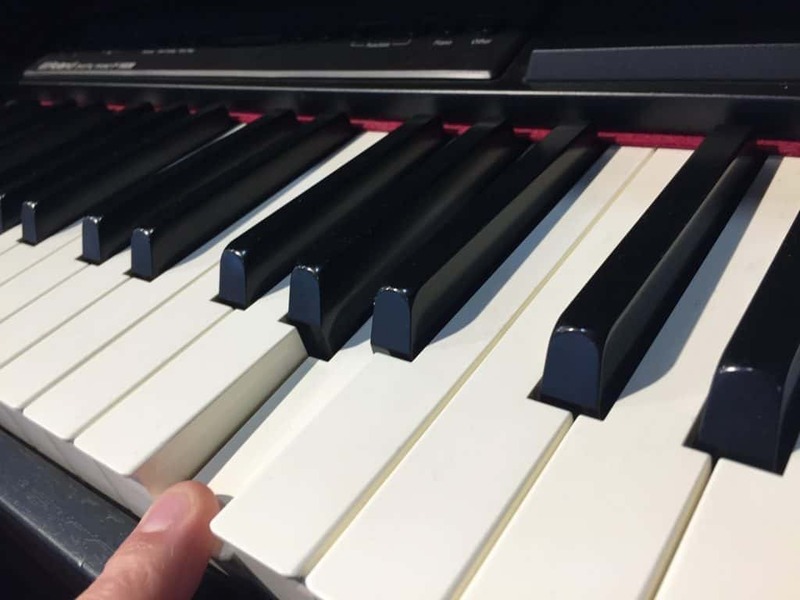 Being able to play along with built-in songs gives beginner piano players the chance to add songs to their repertoire without having to buy sheet music. Playing along with songs also helps beginners to develop a better understanding of timing and dynamics. Digital pianos that offer duet mode allow players to play alongside their piano teacher or another fellow musician. Being able to share the keyboard without scooting over on the bench will make the teaching and learning process much easier. Players can play along with someone else and mimic their finger positions easily. Key action is a matter of preference, but weighted or hammer action keyboards more closely mimic an acoustic piano’s keyboard than semi-weighted keyboards do. Hammer action keyboards use mechanical hammers to imitate the movement of hammers inside of a piano, and graded hammer action keyboards simulate the gradation of a piano’s keyboard by having a heavier lower end of the keyboard and a lighter high end. Semi-weighted keyboards have a lighter feel than their hammer action counterparts. Graded hammer action keyboards are the best option for people who want to play acoustic pianos in addition to their digital piano, and semi-weighted keyboards are good for those who won’t mind having to adjust to using a heavier touch if they eventually play an acoustic piano. Let’s begin with the Casio PX-160. This digital piano uses Casio’s Tri-Sensor Scaled Hammer Action II keyboard and simulates the feel of an acoustic piano’s ebony and ivory keys. The Casio Privia PX160’s Hammer Response feature mimics the speed at which different sized hammers inside a piano move in relation to the velocity at which the keys are played. This digital piano uses real hammers to simulate the hammers inside of an acoustic piano striking the piano’s strings, and the keyboard is graded, which means that the higher-register keys are easier to press than the lower-register keys. Thus, the feel of the key action is extremely similar to that of a piano. The Casio Privia PX160 includes 18 built-in voices, from electric pianos to the vibraphone. This digital piano has 128-note polyphony and has reverb, chorus, brilliance, and a hall simulator built in. With this amount of polyphony and these effects, players can experiment with all of the built-in sounds without worrying about note dropout (an unfortunate side effect of not having an adequate amount of polyphony that causes some keyed notes to not produce sound). Split mode lets players of this digital piano play one sound in the keyboard’s upper register and another sound in the lower register. Duet mode lets players split the keyboard in two and play alongside their piano instructor or a friend. Layer mode makes it possible for digital pianists to play one voice over another, like a piano accompanied by strings for example. The Casio Privia PX160 has 60 built-in songs, and players can play along with them to practice their piano skills. This digital piano also gives players the option to practice the right and left hand parts separately and to adjust the tempo of the songs. The Music Library allows users to save 10 original songs to the digital piano’s memory, and two track recording makes the recording process extremely simple. The Casio Privia PX160 is also MIDI and USB compatible, so it can be used with external recording software,too. The Alesis Recital Pro has a weighted keyboard with adjustable touch sensitivity. The touch sensitivity can be set to soft, medium, hard, or off, which results in a fixed velocity. This digital piano has 12 built-in voices, including organs, synths, and bass. The Alesis Recital Pro also has split and layer mode. With 128-note polyphony, this digital piano can support the average player’s experimentation with intricate chords and the keyboard’s effects, like chorus, reverb, and modulation. Alesis is especially known for their MIDI controllers and the Recital Pro can be used as one with electronic recording software; to record, simply attach this digital piano to a computer via the USB port and start playing. This digital piano makes it easy for new players to get started on their new instrument by including a 3-month subscription to Skoove Premium, an online piano lesson service. This digital piano has a semi-weighted keyboard, which is perfect for players who don’t want to press the keys as heavily as they would have to on a hammer-action keyboard. Players also have the option to change the key sensitivity to suit a softer or harder touch. The Artesia PA-88W’s Grand Piano sound is created by a three-layered sample, and this voice is as rich and authentic as can be expected at such a low price. This digital piano also included eleven additional built-in voices and reverb and chorus effects. The Artesia PA-88W has 32-note polyphony. This amount of polyphony will not appeal to more experienced and advanced players, but it is enough polyphony for beginners. This digital piano is great for people who want to perfect their piano skills without blowing their budget. At $279.99, it would be hard to find a cheaper, quality digital piano. The Artesia PA-88W would work well as a child’s first keyboard, too. Because it’s under $300, parents won’t be too upset if their child gives up on learning how to play piano soon after taking up the instrument. This digital piano uses a hammer action keyboard, and the weighted keys are similar to those of an acoustic piano. The Alesis Coda Pro comes with 60 built-in songs that players can play along with and eventually add to their repertoire. This keyboard also offers layer mode, duet mode, and split mode. Like the Alesis Recital Pro, this keyboard can be hooked up to recording software via the USB port. This keyboard has EQ, reverb, and chorus and 64-note polyphony. This amount of polyphony is a little low for advanced players, but it leaves ample room for creativity for those who are just starting out and don’t plan to heavily layer sounds and effects. 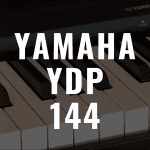 The P45 is the cheapest Yamaha digital piano on the market and is a great introduction to the brand. This digital piano’s keyboard is made with Yamaha’s GHS (Graded Hammer Standard), which means the keys are lighter in the high end and heavier in the low end like on an acoustic piano’s keyboard. The keyboard’s sensitivity can be adjusted to hard, medium, soft, and fixed to suit any pianist’s touch. This digital piano’s 10 built-in voices were created with AWM (Advanced Wave Memory) sampling. This type of sampling uses digital technology to capture realistic instrument sounds. Layer mode lets Yamaha P45 owners play one voice on top of another, and duet mode lets them play along with someone else. This digital piano has 64-note polyphony like the Alesis Coda Pro. Again, this amount of polyphony is low for advanced players, but it is perfectly acceptable for beginner to intermediate players. This digital piano does not have recording capabilities, but it can be hooked up to a computer via a USB connection to record music. At $279.99, this keyboard is by far the cheapest on this list. All of these digital pianos come in at just under $500. Four out of five keyboards listed in this article have hammer action keyboards, but these two are graded, which means they more closely imitate the feel of an acoustic piano than the others. This digital piano has a semi-weighted keyboard, so the feel of the keys is less realistic. With 128-note polyphony, both of these digital pianos give players the freedom to experiment with the keyboards’ features without the fear of note dropout. With 32-note polyphony, the Artesis PA-88W’s polyphony cannot fully support playing with a sustain pedal or with the keyboard’s effects active. Players will have to be careful to avoid note dropout when experimenting with the keyboard’s voices or playing intricate chords. The Alesis Coda Pro digital piano has 20 built-in voices, which means it offers players the greatest variety of available sounds. With 18 built-in voices, the Casio Privia PX160 is a close second. This digital piano contains 10 built-in voices. Although this is just half of the Alesis Coda Pro’s sound offering, someone who only intends to use their digital piano as a replacement for an acoustic piano might not mind the lack of sound variety. The Best Bang for Your Buck? The Casio Privia PX160 is the best of the digital pianos listed here. The Casio Privia PX160 is tied with the Alesis Recital Pro for the highest note polyphony, but its ability to hold ten user songs as opposed to the Recital Pro’s one helps it to secure the top spot. Both can be hooked up to recording software, but the Casio Privia PX160 gives players who don’t have access to recording software more opportunities to record original songs. The Privia PX160 also includes eighteen built-in voices. This might not seem all that important but having the option to experiment with different sounds makes playing a digital piano much more fun. Playing around with various instrument voices can spark inspiration for budding songwriters, too. Part of the fun of owning a digital piano is experimenting with sounds that are not available on an acoustic piano, and the Casio Privia PX160 gives players quite a few voices to experiment with. With 60 built-in songs, this digital piano makes it easy to learn how to play some classic tunes, and the option to practice the left and right hand parts separately makes it possible to perfect each hand’s part before attempting to play the full song. This digital piano’s hammer action keyboard closely mimics the feel of an acoustic piano, which makes for a smooth eventual transition from a digital piano to a real one. 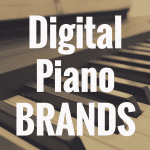 As you try to decide which digital piano to purchase, refer back to this article often. Read reviews of these models, watch demos of their sounds and other capabilities, and keep your own piano-playing goals in mind. Choose a digital piano that offers room for growth and experimentation; doing so will motivate you to stick with the instrument and will help you to develop your creativity and musicality quickly. Kawai KDP-110 review: Better than the KDP-90? What is the Best Yamaha Digital Piano with Weighted Keys? Are Yamaha or Roland Digital Pianos Better? How to Pick the Best Yamaha Arius Digital Piano? 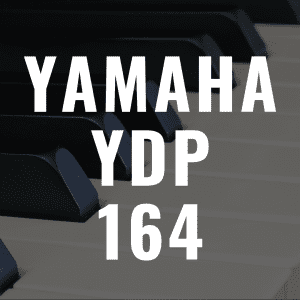 Yamaha YDP-144 review: Better Than the YDP-143?